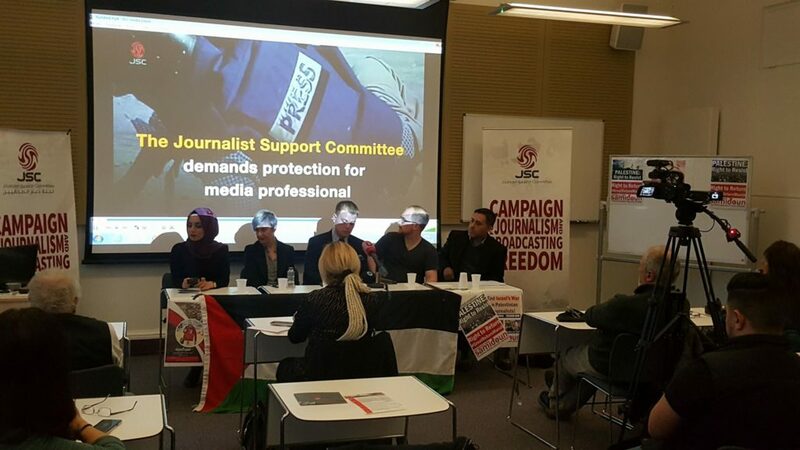 On World Press Freedom Day 2018, the Journalist Support Committee held a conference in London on the “Challenges of Palestinian Journalists” living and working under occupation. 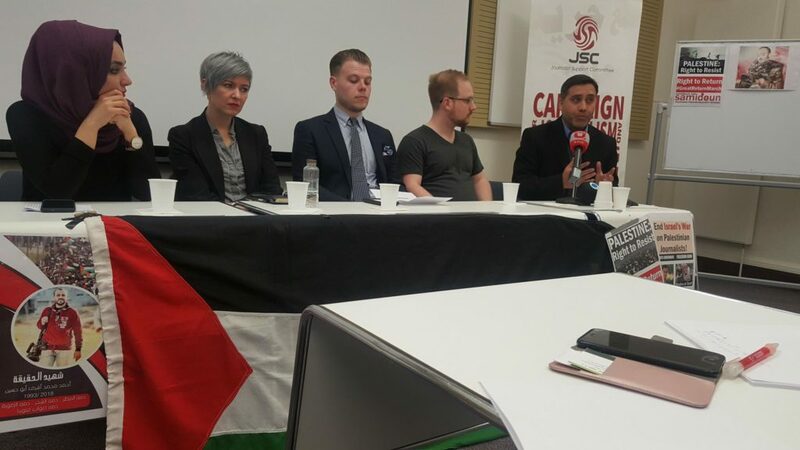 Prominent journalists, media analysts and activists demanded British media institutions and agencies to break the silence and stand in solidarity with Palestinian journalists living and working under occupation. 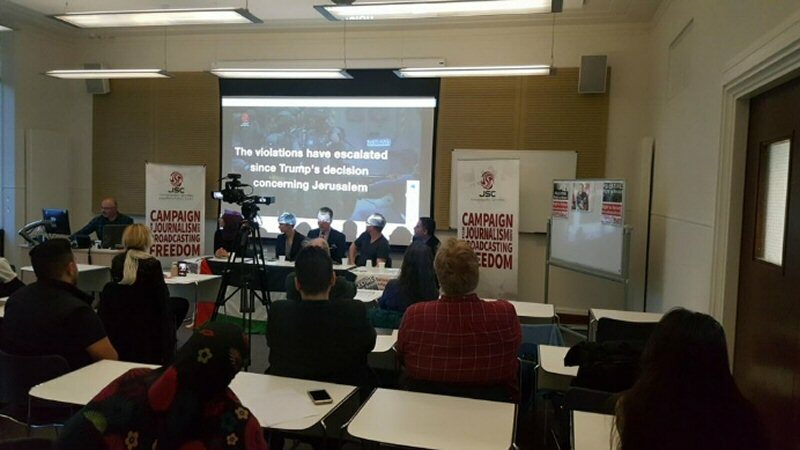 To mark World Press Freedom Day, the Journalist Support Committee held a conference in London on the systematic targeting of journalists by Israel. Roshan Salih, a prominent Journalist at Press TV, said: “Compared to western journalists, Palestinian journalists are heroes. Palestinian journalists go out and they literally don’t know whether they are going to come back home in body bags, or end up losing a limb, or whether they are going to end up in prison for months on end”. “It is a really important thing to recognize that on this occasion of World Press Freedom Day”, Chandler adds, “that in 2018 it is still very difficult for journalists who are based in occupied Palestine to report the truth because they have to then take their materials back to an editorial team that talks about something called “balance”, but it is not actually about balance at all”. 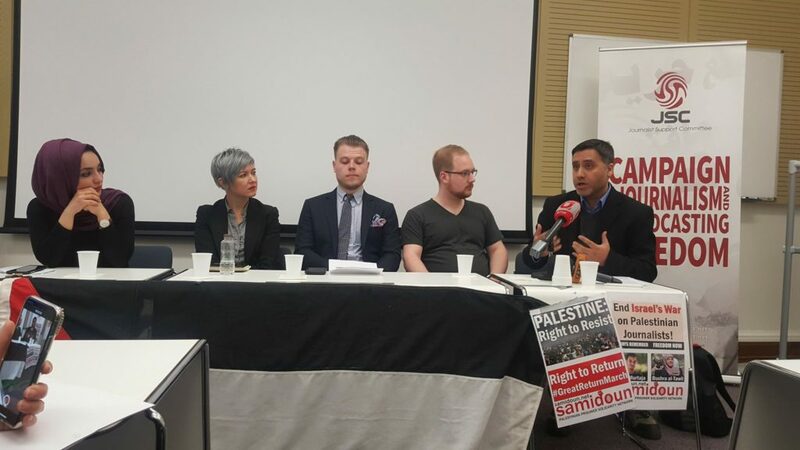 At the Conference, Samidoun – Palestinian Prisoner Solidarity Network demanded the release of over 20 Palestinian journalists from Israeli jails and called for an arms embargo on Israel. It also condemned the role of the Palestinian Authority, asserting its complicity in the denial of rights to Palestinian journalists, under the so-called Electronic Crimes Law. An Iraqi journalist and an attendee at the conference, Yusra Mhadi, said “I think there is a very important point that we have to focus on and that is that Palestinian journalists are not just being oppressed by the Israeli entity but also by the Palestinian Authority; Palestinian journalists are being attacked and imprisoned by the Palestinian Authority. So, it is important for us to stand by Palestinian journalists to protect them against all those who have failed them. And it is important that we build a wall to protect Palestinian journalists because it is important for their voices to reach everywhere in the world. And we know that the PA is also playing a part in depriving this voice from reaching the world”. The conference talked about Palestinian journalists Ahmed Abu Hussein and Yaser Murtaja, both killed by an Israeli sniper while covering the Great Return March in besieged Gaza. Jehan Farra, Palestinian journalist and a friend and colleague of Yaser Murtaja, said “Yaser always made us laugh whenever he comes into the office, he had such a big bright smile; he was a very vibrant person, lively and optimistic too, regardless of everything he went through. Yaser was hard working; he started a small media agency from scratch; began with him and his friend and two cameras and ended up with 15 staff members. He was a talented and ambitious young man”. Palestinian journalist Mohammed Hassan, a SOAS University student and colleague of Ahmad Abu Hussein, said “Ahmad had a very charismatic personality. He was a hard working and courageous young journalist; his latest work on the Great Return March was outstanding, his wish was that one day he will report from Palestine 1948; after our people in Gaza achieve victory in smashing the borders”, said Mohammed, “Ahmad will continue to live in our hearts and our struggle for return and liberation”. 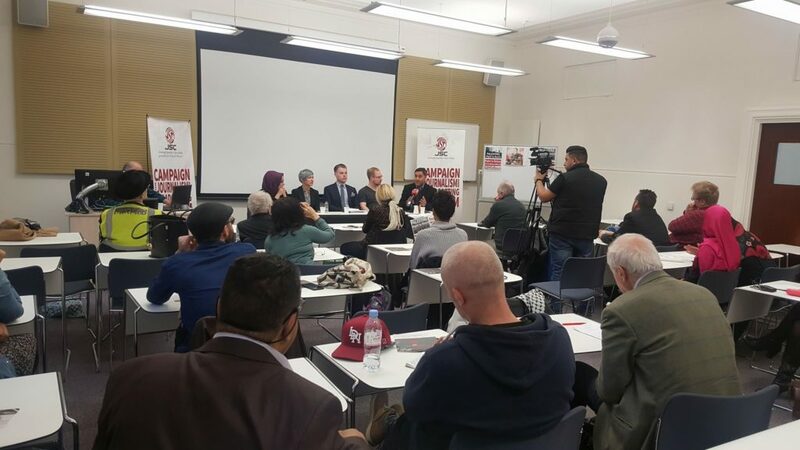 Speakers and attendees criticized the complicit role of news agencies and media institutions in Britain and the silence on the killing and imprisonment of many Palestinian journalists. “This media silence in Britain is shameful and cowardly, unfortunately it is not surprising a lot of these people are told by their superiors what they are not meant to report on and what they are meant to report on, and this is one of the things they are not meant to report on” said Daniel O’Brien, media analyst and member of the CPGB-ML. “The media in Britain is largely state apparatus”; said Kit Whylett from the Revolutionary Communist Group, “it is the mouthpiece of British imperialism; their entire job is to serve the British state and that is why they have been so silent and refusing to acknowledge the work of many Palestinian journalists”. Samidoun Palestinian Prisoner Solidarity Network stands in solidarity with Palestinian journalists on World Press Freedom Day, as they regularly face imprisonment, repression, surveillance, targeting and outright assassination. The cases of two Palestinian journalists, Ahmed Abu Hussein and Yaser Murtaja, shot and killed by Israeli soldiers during the Great March of Return in Gaza – as well as the injury of many more – have highlighted the daily threat under which Palestinian journalists labor. Palestinian journalists face not only a threat to their lives, but a constant threat to their liberty. Journalist Bushra al-Tawil, also an advocate for Palestinian political prisoners, is herself jailed without charge or trial in Israeli jails under administrative detention; she is among three women and 500 Palestinians total held without charge or trial at this time. Omar Nazzal, member of the Secretariat of the Palestinian Journalists’ Union, was held in administrative detention for 10 months after he was seized at the Karameh crossing to Jordan while traveling to attend the conference of the European Federation of Journalists in Sarajevo. Palestinian refugee journalist Nidal Abu Aker, who produces a program on Palestinian prisoners for Wihda Radio, the only station based in Dheisheh refugee camp, has been held in administrative detention for nearly two years. The repeated detention of Palestinian journalist Mohammed al-Qeeq also highlighted the situation of Palestinian journalists. He spent 94 days on hunger strike to demand his release and won his freedom; in 2017, he was again jailed after attending demonstrations to demand the release of Palestinians’ bodies held hostage by the Israeli occupation. In addition, Palestinian journalistic institutions like the Elia Association for Youth in Jerusalem have been targeted for closure under the orders of far-right Israeli Minister of Defense Avigdor Lieberman. Palestinian radio station Sanabel was seized by Israeli forces and five of its staff arrested and imprisoned. Palestinian television stations regularly face closure, while staff members are arrested for doing their jobs in the media. The Palestinian Authority is also complicit in the denial of rights to Palestinian journalists, including the arrest and interrogation of journalists who publish critical stories about PA officials to the blocking of multiple news websites to Palestinians under occupation under the so-called Electronic Crimes Law. This cannot be separated from the commitment of the PA to “security coordination” with the Israeli occupation, as the silencing of Palestinian journalists serves the strategic objectives of the Israeli state. The targeting of journalists and writers is nothing new; we remember the historic assassinations of Palestinian writers like that of groundbreaking novelist, writer and revolutionary Ghassan Kanafani in 1972. The work, the images and the words of Palestinian journalists are critical in sharing the Palestinian experience, narrative and struggle with the Palestinian people, the Arab world and international audiences. On World Press Freedom Day, Yaser Murtaja and Ahmad Abu Hussein live on in the work of every journalist who exposes the reality of the Palestinian situation. Samidoun Palestinian Prisoner Solidarity Network salutes Palestinian journalists in occupied Palestine, in the refugee camps and in exile bringing the Palestinian story to the world despite repression, racism and attempted criminalization. We demand the release of over 20 imprisoned Palestinian journalists and an end to the systematic closure, prohibition and targeting of Palestinian media agencies and workers. Palestinian journalists must receive international solidarity and Israeli occupation forces must be held accountable, including through global sanctions and an arms embargo, for their targeting of Palestinians who document the stories of their people.